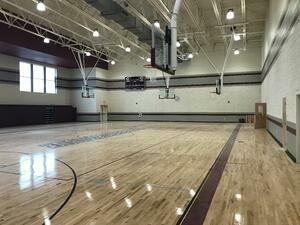 We are very excited to announce the completion of Collierville High School’s athletic complex. Toadvine took the lead in designing, producing, & installing the outdoor grandstands for football (home & visitor), baseball, softball, soccer, & tennis. 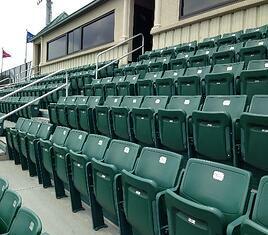 These grandstands including VIP chairs were manufactured to match Collierville’s school colors. Outdoor athletic equipment was also provided for baseball, softball, and track & field. In addition, we provided and installed both basketball & volleyball systems for the new main gym and (2) auxiliary gyms. Thanks to the folks at Collierville High School for entrusting Toadvine to complete this project and for allowing us to have a role in building such a great athletic complex. 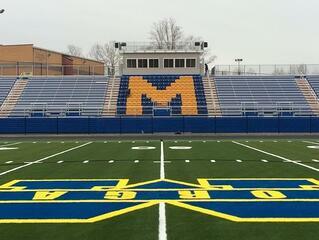 The students, faculty, parents, & fans should enjoy this outstanding high school venue for years to come. 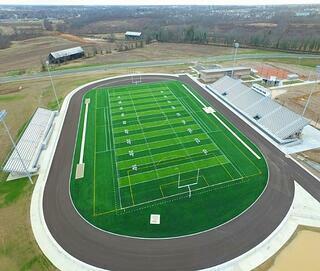 Take a look at the news story below to see how beautiful this sports complex turned out. Toadvine is excited to announce our involvement in the construction of the new Collierville High School that is scheduled to open in the Fall of 2018. 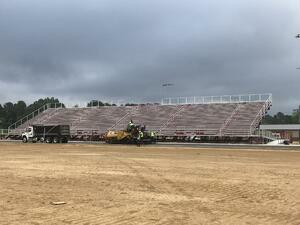 Toadvine is providing construction of the outdoor grandstand bleachers for football (home & visitor), baseball, softball, soccer, and tennis. Toadvine is also providing indoor volleyball equipment and outdoor athletic equipment for track, baseball, and soccer. In addition, Toadvine is providing the ceiling suspended basketball goals for the main gym as well as both auxiliary gyms. Here is quick update on the project. Porter Athletic goals are up in all 3 gyms; installation was completed in late February. 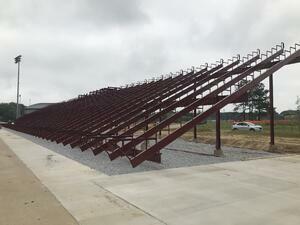 Visitor Side – Bleachers were installed in early May; currently finishing up final touches on ramps & walkways. Home Side – Steel beam infrastructure was completed in mid-May; currently installing seat planks, foot boards, risers, ramps & walkways. Stay tuned for the next update during the construction of this impressive new school. 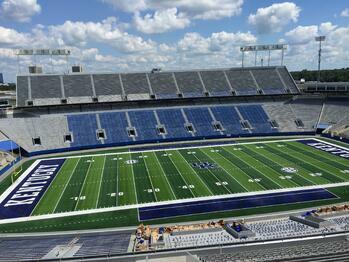 When completed, it will have one of the best athletic facilities in the state of Tennessee. The gym must be a safe place - right? Floors are regularly cleaned and inspected for damage, bleachers are lubricated and seats are tightened, and electrical and plumbing systems are subject to strict codes. But what about the stuff hanging over your head? 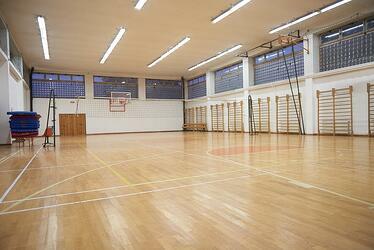 Too often, basketball backstops are the most overlooked piece of equipment in your gymnasium. Once the backstop system is properly installed, it is the schools responsibility to inspect and maintain that equipment. 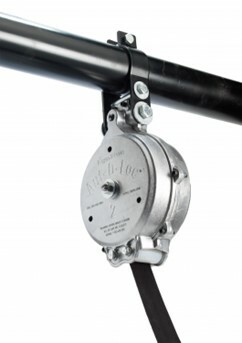 Pulleys, cables, components, limit switches and many other factors can contribute to failure of a suspended backstop. The one overriding factor in all falls is the lack of a fully automatic safety strap. The majority of existing units lack a fully automatic safety strap and aren't regularly inspected. What Happens if a Basketball Backstop Falls? When you turn the key to lower or raise your basketball backstops, do you ever think about what would happen if a cable suddenly snapped? 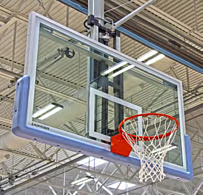 Many athletic directors and staff members who operate basketball goals are quite weary of the size of these units and keep a close eye on the unit when raising or lowering them. The movable portion of a backstop system can weigh close to 1,000 pounds and can be suspended 20 to 30 feet above the court floor. Together, when these systems fall, they can generate thousands of pounds of force on impact. It usually damages the backstop structure and facility. More importantly, it can also cause injury to spectators below. The type of damage that occurs when this happens can include damaged gym floors and bleachers, pipes damaging ceilings and walls, and even fractured ceiling beams. Safety straps are the seatbelts for your ceiling-suspeded basketball goals. This piece of equipment acts as a backup so that if the cable ever failed, the safety strap acts like the seatbelt in your car and stops the backboard from falling. Many older safety systems were not automatic and pinched the belt when triggered, requiring a manual reset of the unit. After having to travel 30 feet high to reset the unit a few times, many were just removed from the backstop and tied off to avoid having to reset them. Today, safety straps are fully enclosed, self-checking, reset automatically and work silently in the background. Why Get Safety Straps for your Basketball Backstops? There is no good reason for any movable backstop to not have a safety strap installed. Safely securing a piece of ceiling-suspended equipment will give you peace of mind for not only the safety of parents, coaches and student-athletes but also for your finances. Accidents happen sometimes besides our best efforts to prevent them. Having a proper safety system installed will provide a greater level of safety. If you do not already have a preventative maintenance plan for your basketball backstops, we suggest you plan one now. If you do not have the resources or expertise to perform an initial inspection or to provide preventative maintenance, there are qualified inspection and maintenance companies like Toadvine who can provide this service for you locally. By following some of these general guidelines for better backstop safety, the next game in your gym can be a safe and enjoyable experience for all involved. Investing in a new and upgraded scoreboard is another way to create revenue streams to pay for facility projects and ongoing program expenses. Your fan’s eyes are constantly glancing at the scoreboard almost as much as they are watching the actual game. With the purchase of a new scoreboard, local companies will be lining up to get their message on your board whether it be in video form or with scoreboard signage. Upgrading your scoreboard will more than pay for itself but also provide a better overall experience for all particip ants. As an add-on to a season ticket package, offering reserved parking would not only increase the overall experience and convenience of attending games but also offer an additional source of revenue. Logistically, implementing a traffic control attendant to direct members to their reserved spot would also help the flow of traffic in an area full of children. Along with the safety aspect, creating a community in the parking lot, before the game, could greatly increase the community’s comradery and support of your team. Developing your fan base always increases revenue to help grow your program. Charging an easy $30 per season for reserved parking could bring in $2,000-$3,000 in additional revenue. We'll Be at KSPMA in Lexington! We are so excited for the 26th annual Kentucky Plant Management's Conference in Lexington. As the only conference in Kentucky dedicated to educational facilities, Toadvine takes part in this event to stay up to date with state regulations and codes for Kentucky schools and to learn about state of the art technology to bring back for our customers. For 23 years, the Kentucky Plant Management Association (KPMA) has partnered with the community with the goal of providing Kentucky students with a school environment that will enable them to excel. Often times, facility managers feel overwhelmed with everything that goes along with not only the maintenance of a school facility, but keeping the school up-to-date with the latest equipment and technology as well. At this conference, you can come together under one roof with all of the businesses and suppliers that it takes to run a school facility and learn strategies for managing your resources to keep your facility in optimum shape! You will also hear the latest in federal and state regulations as well as requirements and codes for school facilities so that you will not have to pay the penalty for failing to meet the standards. Workshops are given on facilities management issues with awesome strategies, tips and training for building management. A trade show displays over 115 products for school maintenance & operations. October 20-23, 2015 at the Embassy Suites Hotel 1801 Newtown Pike Lexington, Ky. If you are a school facilities manager, we urge you to come and be empowered by this event! If you are a business that makes products or services for school facilities, don't miss your opportunity to connect with over 300 school facility attendees! Visit the Kentucky Plant Management Association to register for the conference or to learn more. UK has had a great start to the season, winning 3 out of 4 home games so far. The weekend before last, the Cats beat their first ranked opponent since 2010, Missouri (ranked 25th), and this past weekend they beat EKU. A win is a win right? We have to wonder if the success could be due in part to the renovated stadium that we helped complete in September before the start of the season. In a recent Business First article, Tom Jurich, the director and president of athletics for the University of Louisville, talks about the importance of having state of the art facilities in order to recruit the best athletes to your school. And both Kentucky and Louisville definitely have some great players this year! We also believe that fans are a huge part of the success of a team. A new state of the art stadium helps to boost the morale of not only the players, but the fans as well. 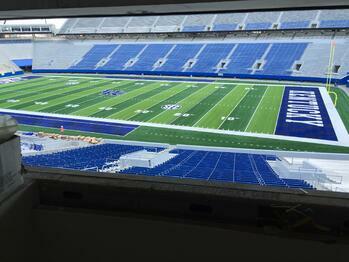 We are sure that the new $110-million renovation will keep the Commonwealth Stadium full of Cats fans the entire season! So what exactly did we do to the stadium? Toadvine Enterprises was responsible for adding the blue backrests to all of the lower bowl seats, which makes them a lot more comfortable! Trust us--we've tried them out. We were also responsible for closing in the in-zone around the recruiting platform with box seats for hosting large parties or impressing business clients. We highly encourage you to buy tickets in this section! The complete renovation includes a complete makeover of the outside of the stadium, giving it a more modern look, as well as a revamped concourse and concessions area that has been widened to give the stadium a more open feel. 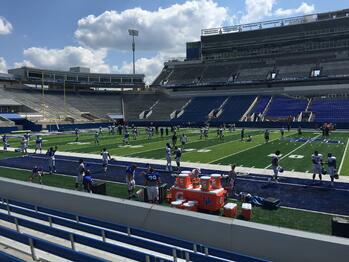 Check out our pictures below and be sure to come out and support the Cats and see the new and improved Commonwealth Stadium for yourself! The next home game is November 28, against Auburn. Here at Toadvine, it is our goal to make sure your athletic needs are met. From the bleachers to the locker room, we've got you covered. We like to focus on things like maintaining your equipment, getting the most sports fun for your buck, and keeping your team in tiptop shape. Today, though, we want to talk about how we can help you wrap up your spring season and get ready for the fall. 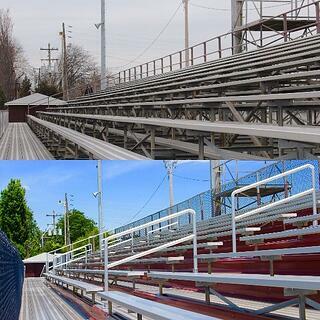 With sports like baseball, softball, lacrosse, and tennis wrapping up, now is a great time to do maintenance on your seating and bleachers. Our maintenance and safety arm of the business, Vine and Branch LLC, can do a full-service inspection of your seating and bleachers to make sure they are up-to-date and safe for use next season. Your fan's safety is one of our biggest concerns, schedule your yearly inspection today. As fall approaches, we can help you prepare for the football, soccer, basketball, and volleyball seasons. We offer a wide variety of indoor and outdoor scoreboards, including the industry's newest and most technologically advanced scoreboards manufactured by Nevco. Our other fall products include basketball systems, accessories, padding, and volleyball equipment. For any of these products, or additional equipment you may need, contact our insides sales team to get a quote. Our outside sales team can help you with custom projects. No project is too small or too big. 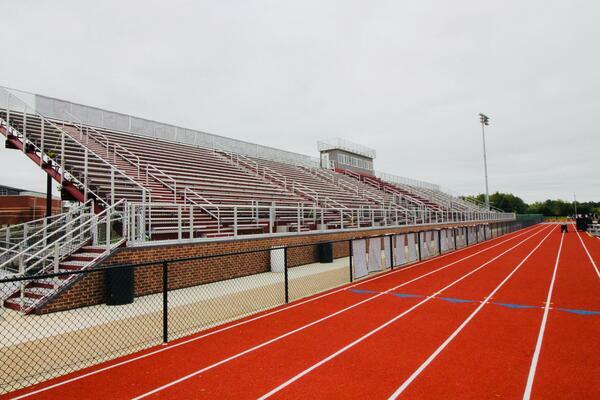 We've done everything from The University of Louisville's baseball stadium to Eastern High School's football bleachers. Your project is just as important to us as it is to you and we want to make sure it is done correctly from start to finish. To get your project started schedule a facility visit. We service and sell products in Kentucky, Indiana, Tennessee, and Ohio. We also sell some products outside of that region. Visit our website to find out more. Do you want to dunk in style like UofL's Montrezl Harrell or do you need something more moveable so that you can nail that dunk with less risk of injury? 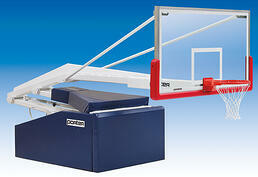 Whatever your preference, Toadvine has a basketball goal to fit your needs. You can select from a vast array of goals and backboards ranging from adjustable height to fold up systems. We also carry classic goals and more advanced goals like the Torq-Flex series with shock absorber mechanisms. TORQ-FLEX(R) 180 Goal is the ultimate moveable goal. From the front of the rim it allows for 180 degree movement. As opposed to your standard break away rims, this goal allows for lateral flexing which can be a huge plus for injury reduction during dunks. High-tensile steel torsion rods allow for the goal to pivot in all directions. If you have questions about any of the products we carry, just let us know. We will be happy to help you decide which products will serve you best.